East Meadow, Long Island, New York. Temple Emanu-El sanctuary. Davis, Brody & Wisniewski. 1963. Photo: Brad Kolodny 2018. Brad Kolodny, who has been busy for the past few years photographing the synagogues of Long Island, New York, reports that the sanctuary at Temple Emanu-El in East Meadow, New York, was deconsecrated at a service on June 10th. The round sanctuary built in 1957 was designed by the innovative and influential architectural firm of Davis, Brody & Wisniewski. It was featured in the 1963 exhibit Recent American Synagogue Architecture at The Jewish Museum, curated by Richard Meier. 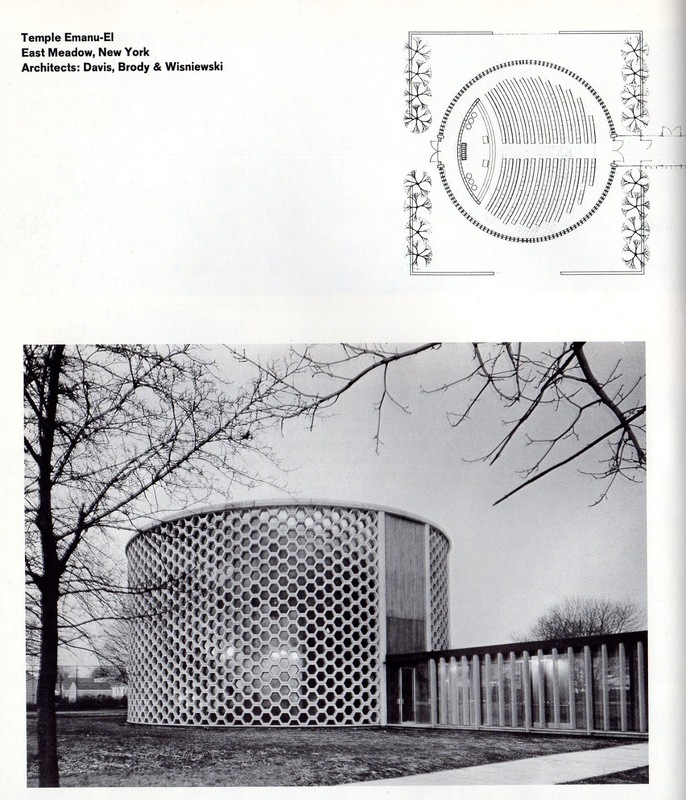 The catalog of the exhibit became something of handbook for modern synagogue design in subsequent decades. East Meadow Long Island, New York. Temple Emanu-El sanctuary. Davis, Brody & Wisniewski, 1963. Page from catalog of Recent American Synagogue Architecture at The Jewish Museum, curated by Richard Meier. 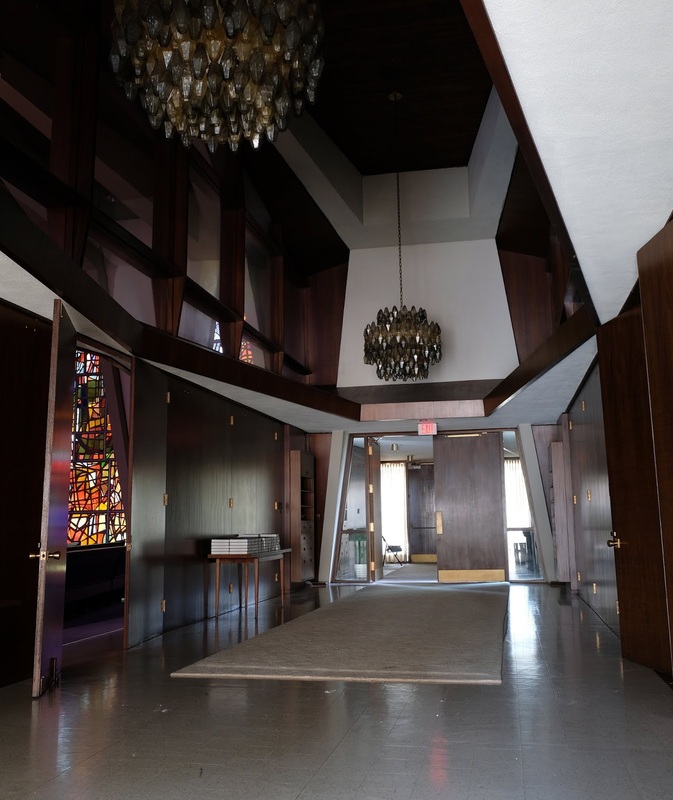 Temple Emanu-El was strikingly different and noteworthy in its day but has fallen into disrepair, and the now-smaller congregation has merged with Temple B'nai Torah in nearby Wantagh, and has now moved to that congregation's building. A recent story from the Long Island Herald discusses the merger, but nothing is said of the building or its architectural design and significance. The road to a new beginning: Temple Emanu-El officially merges with Temple B'nai Torah (June 14, 2018). 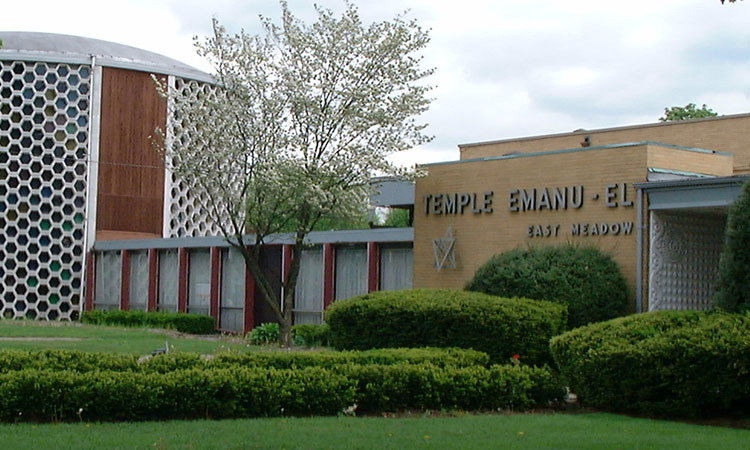 "Although June 10 marked the closing of Temple Emanu-El, it also was the beginning of a new congregation, and Bar-Nahum said, “There’s no break in between our community’s existence....After the last religious service in East Meadow, nearly 200 congregants marched in the heat for 3.8 miles to their new home at Temple B’nai Torah, with dozens taking turns carrying the Torah." East Meadow Long Island, New York. Temple Emanu-El sanctuary, plan. Davis, Brody & Wisniewski, 1963. Detail from catalog of Recent American Synagogue Architecture at The Jewish Museum, curated by Richard Meier. 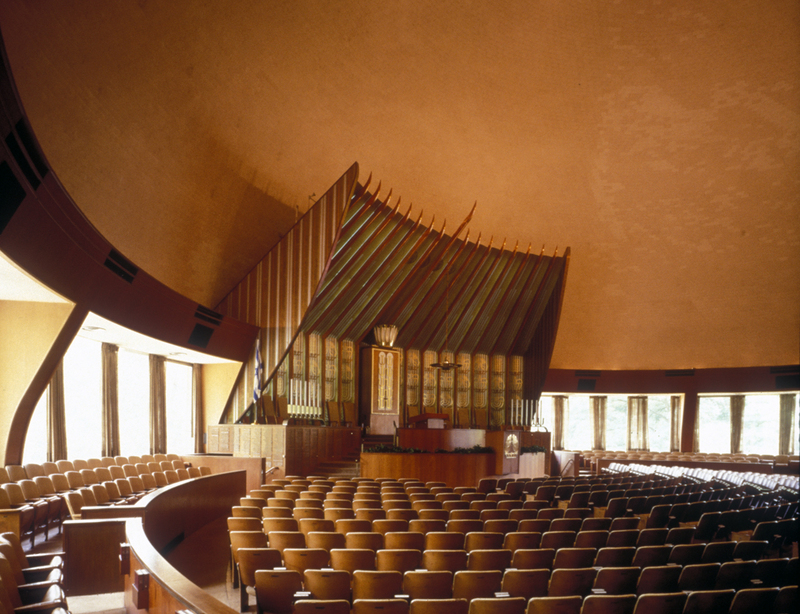 Temple Emanu-El is one of several innovative modern synagogues designed by Davis, Brody & Wisnieski in the late 1950s and early 1960s. 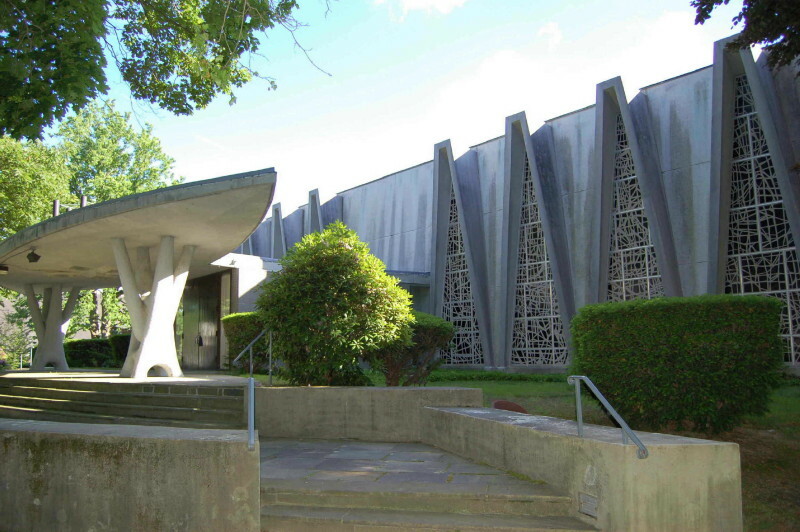 Their Congregation Sons of Israel in Lakewood, New Jersey (1963) is also well known and influential. Both of these buildings experimented with new geometries for the sanctuary. 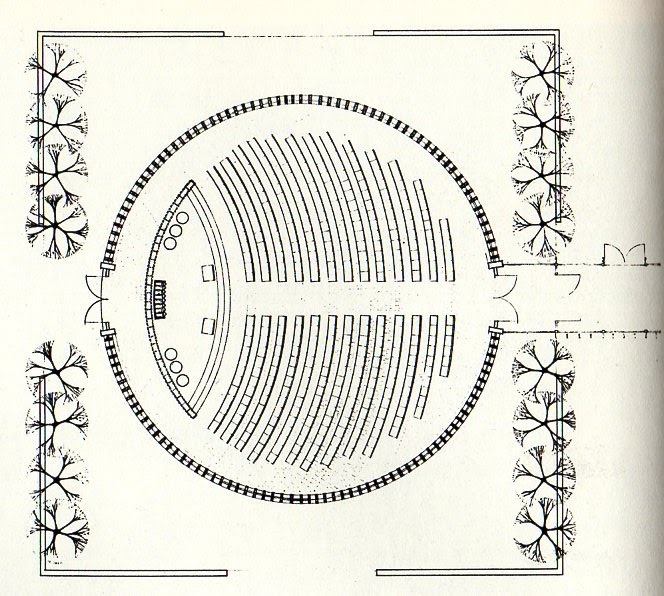 At East Meadow, where they used a circular plan, they implanted a formal axis on a central plan, much as was done in the early 19th century at Vienna's Stadttempel. Although there is no historical tradition of synagogue design, there are some strong traditions of worship and ritual. Traditionally, the synagogue is different from other places of worship in that it is basically a gathering place for laymen; priests are not required. The most important aspect of the service is the reading and studying of the Torah. We have, therefore, striven to express architecturally this unit of ritual and congregation by designing spaces which have a central orientation, developing from the circle, the square, the octagon, rather than the rectangle. Our aim has been to emphasize the centrality and gathering of the congregation under one roof for worship in contrast to the usual axially directed space which sets up an audience to stage relationship. Lakewood, New Jersey. Congregation Sons of Israel. Davis, Brody & Wisniewski, 1963. Detail from catalog of Recent American Synagogue Architecture at The Jewish Museum, curated by Richard Meier. Other leading architects prommoted variations of central plan designs. 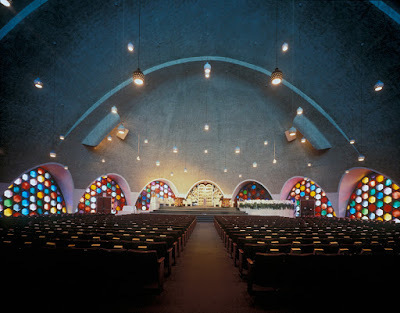 Eric Mendelsohn at Park Synagogue in Cleveland set his sanctuary under a massive hemispherical dome and Percival Goodman built a band-shell style half dome for this temp Sholom in Miami, where the walls were punctuated with patterned windows filled with brightly-colored solid glass panels, much like those used in East Meadow. 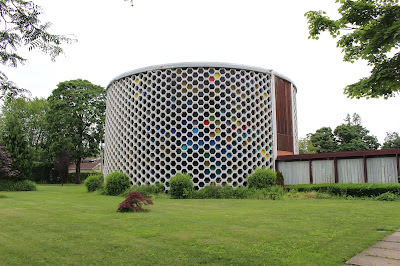 Fritz Nathan at the Jewish Community Center of White Plains (now Congregation Kol Ami) designed a sanctuary that was a half oval, and projected from the greater building mass.The windows - now removed -were by leading stained glass artist Robert Sowers. Cleveland, Ohio. Park Synagogue. Eric Mendelsohn, architect, 1953. Photo: Paul Rocheleau 2002. Miami, Florida. Temple Beth Sholom. Percival Goodman, architect, 1956. Photo: Paul Rocheleau 2002. White Plains, New York. congregation Kol Ami (former Jewish Community Center of White Plains), 1950s. Fritz Nathan, architect. Photo: Samuel Gruber 2009. 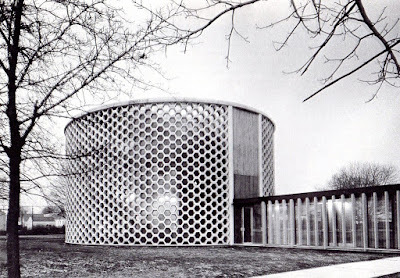 Davis, Brody, Wisniewski connect their East Meadow sanctuary to the rest of the synagogue complex in a new way, however with a long narrow glass enclosed walkway the tethers the round sanctuary to the main buildings as if it was boat on a rope or a balloon on a string. 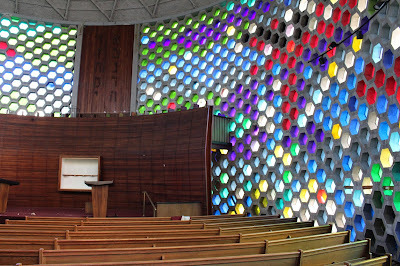 The isolation of the sanctuary in this way allows the maximum expression of its pure geometric form, and also the maximum exposure of its colored windows - inside and out. I'm sure the from without the building must glow with colored light on a Friday night, while it must shimmer with different hues across the bimah and seating at a Saturday morning. East Meadow Long Island, New York. Temple Emanu-El sanctuary. Davis, Brody & Wisniewski. 1963. 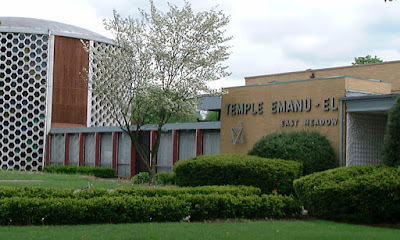 Photo:temple Emanu-El website. 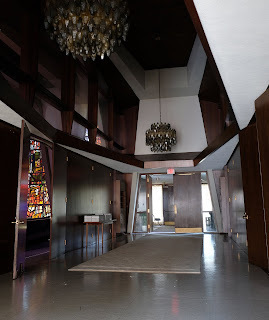 The closure of this sanctuary is a loss to modern American Judaism, and if it is demolished - as has been rumored - then it will be a greater loss to modern architecture overall. I hope the building can be re-purposed and saved, preferably as a religious, performance, or meeting space so the integrity of the design can be maintained. Woonsocket, Rhode Island. B'nai Israel Synagogue. Samuel Glaser, architect, 1962. Woonsocket, Rhode Island. B'nai Israel Synagogue. Samuel Glaser, architect; Avigdor Arikha, stained glass design, 1962. Next week I will join a group art historians, historians, preservation planners, and Jewish community members on a visit to the remarkable B’Nai Israel synagogue in Woonsocket, Rhode Island. 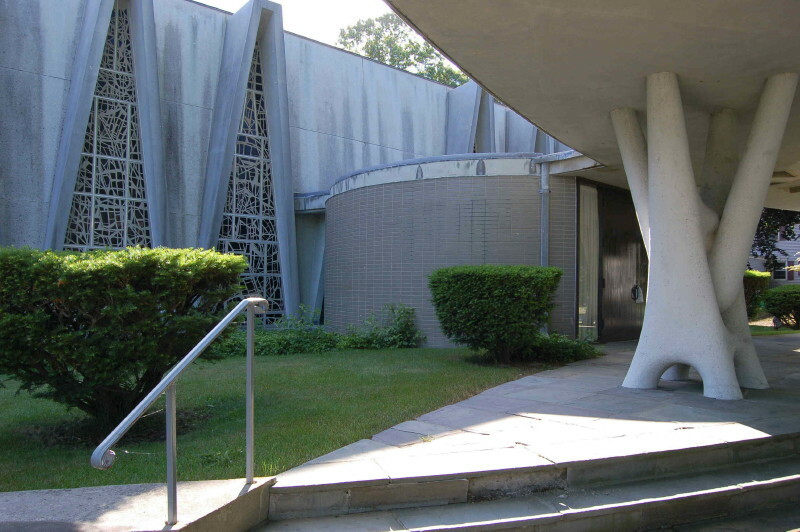 The synagogue was designed by Boston-based Jewish modernist Samuel Glaser (1902-1983), who had previously built Temple Shalom in Newton, Massachusetts. 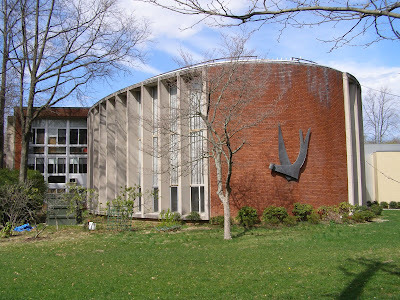 B'nai Israel was dedicated on September 16, 1962. The synagogue is a little known modern American masterpiece, in which Glaser's expressive concrete architecture structure serves as a frame for a dazzling set of enormous triangular stained glass compositions by Israeli artist Avigdor Arikha (1929-2010). Now the future of the building is uncertain. 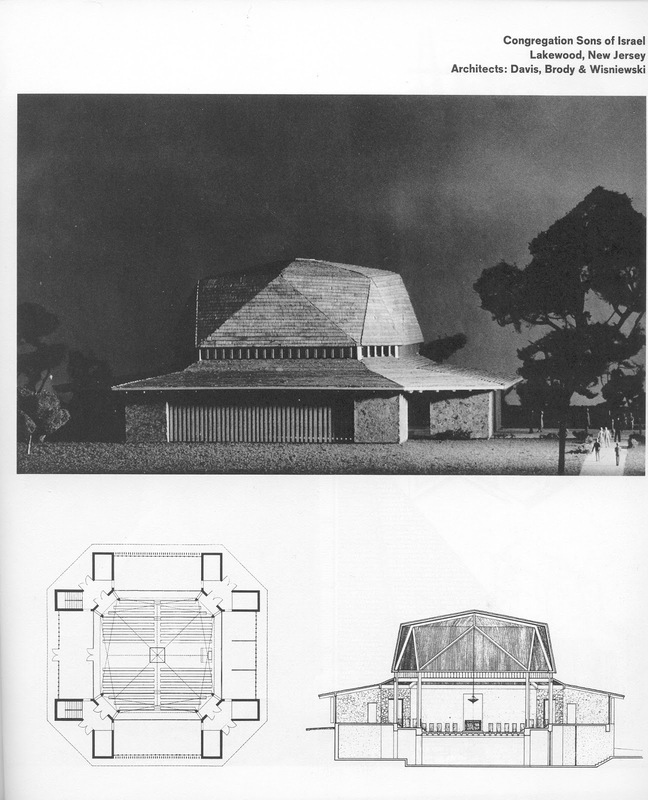 "As he had with Temple Shalom in Newton, Glaser devised an essentially symmetrical plan. 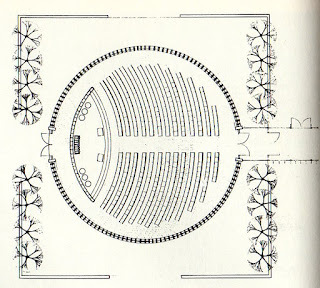 The sanctuary and auditorium, bi­sected by a vestibule, form one long pavilion; when the sanctuary's 260 seats are occupied, 400 folding chairs can be placed in the auditorium. A garden court­yard, called a Court of Festivals, is reached through sliding glass doors. The corridor around the courtyard leads to a lounge, a kitchen, six classrooms, offices, a library, and a chapel. Most of these rooms face the courtyard; a few face a rear parking lot. These interiors are uncluttered, bright, and cheerful. The synagogue's lower level— reached from the vestibule by a grand curving staircase beneath crystal chande­liers, or via a rear staircase (there is no elevator)—contains a vast central space surrounded by kitchens, food service areas, cloakrooms, lounges, and exhibi­tion cases forming a small museum. B'nai Israel combines a rich variety of materials and textures. The main pavilion is reinforced concrete, decorated at its north­ern and southern ends by polychromed brick. Dark woods are used for hallway paneling and overhead beams. The corri­dor outside the chapel is clad with white marble. At the top of the corridor wall, inscribed in Hebrew, is the Kaddish, the prayer for the dead. Beneath, in neat rows, are the names of deceased congregants..."
The sanctuary was further embellished by a parochet and other textiles designed by Anni Albers (1899-1994). 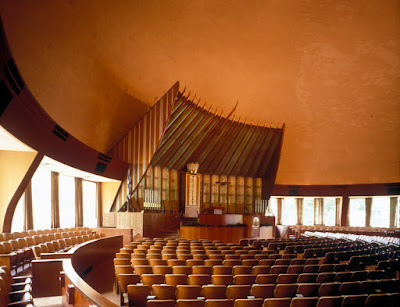 The synagogue also has notable artwork by Ludwig Wolpert (1900-1981), and a bimah design by Glaser's colleague Antonio de Castro (1930-2017). The architect himself donated an outdoor sculpture of a Burning Bush Menorah by Beverly Pepper (b. 1922), that is an early work by the artist who has gone on to fame for her monumental works. 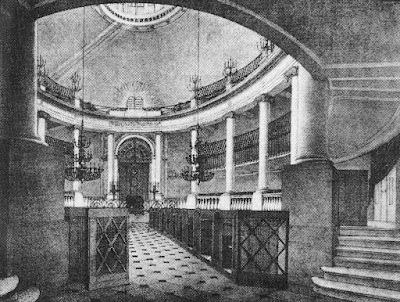 The best images of the synagogue are by Louis Davidson and can be found here at https://www.synagogues360.org/gallery/bnai-israel/. I've only seen this building in pictures, and thanks to distinguished scholar of (medieval) stained glass Madeline Caviness, I now have much better images of the windows - and I look forward to seeing these up close, and even more photographic documentation. Prof. Caviness will be there on July 19th, too, as will George Goodwin. While I reserve final judgement until I fully experience the space and structure of B'nai Israel - I am sure I'll be mightily impressed. The building is related to a significant group of important mid-century synagogue designs related in time, materials, expressive language and architectural and congregational aspirations. 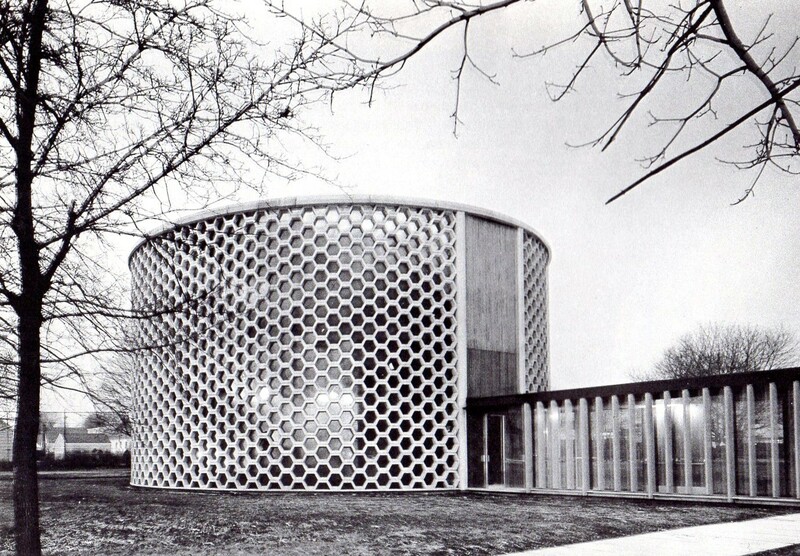 But it does appear to me that B'nai Israel is especially comparable to Minoru Yamasaki's much larger North Shore Congregation Israel in Glencoe, Illinois, completed in 1963, but under designe at the same time. Both buildings appear to be broadly based on the concept of the Mishkhan (Tabernacle or Tent of Meeting) described in Exodus as the first designed religious space of the Israelites. The Mishkhan is described in modular terms, mostly as a framework (Exodus 15-25). The idea of a temporary tent of meeting, erected in the desert for wandering people, had great appeal in the post-World War II period, especially in the combined context of post-Holocaust communal trauma and the widespread American exodus of Jews from cities to rapidly expanding suburbs. While in the late 19th-century American Jews focused on the idea of the Temple, and Reform Jews felt comfortable enough in their new American home to call the synagogue "Temples," and (as I have written elsewhere) to happily adapt Greco-Roman temple forms for synagogue architecture. Glencoe, Illinois. North Shore Congregation Israel. Minoru Yamasaki, architect, 1964. Photo: Paul Rocheleau. 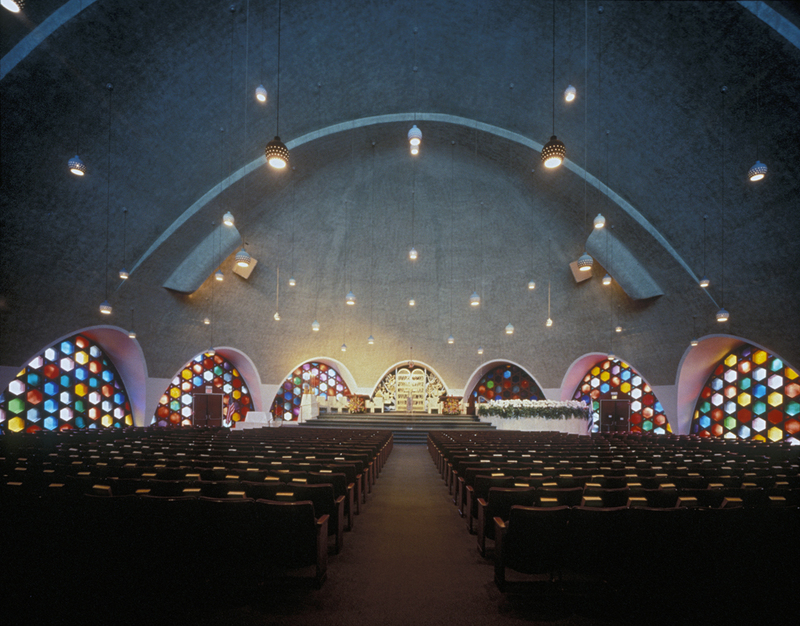 In addition to Yamasaki's influence, Goodwin has rightfully pointed out the relationship of Glaser's use of concrete, especially in the sanctuary ceiling beams, to work by Marcel Breuer. Similarly, there is a correspondence in the position and form of B'nai Israel's entrance vestibule to Philip Johnson's design at Congregation Kneses Tifereth Israel, in Port Chester, New York, though overall Glaser's work is quite different than Johnson's. B'nai Israel is dynamic and expressive; Kneses Tifereth Israel is rational and cool. The future of Glaser's B'nai Israel is uncertain. The Woonsocket Jewish community is now tiny, and even in 1962 when the synagogue was dedicated the community was at its peak. It never grew into the excessive seating capacity of the new synagogue.Today, the building is need of repair, but it is not clear how much and how urgently. 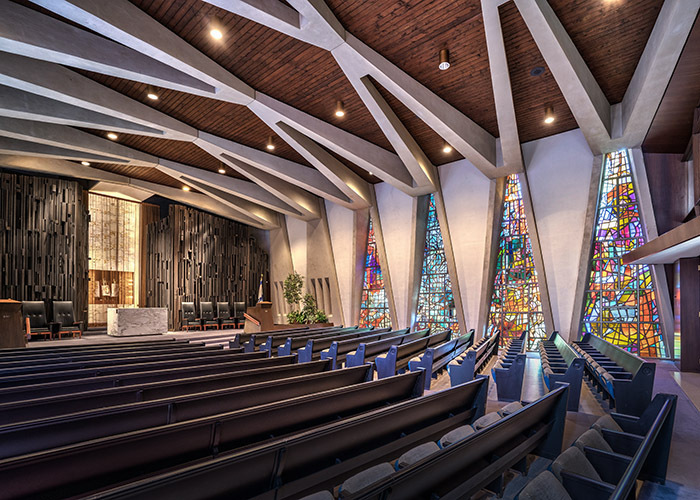 Like so many other important religious buildings of the 1950s and 1960s, B’nai Israel now suffers from changing demographics, and changing tastes and style in religious worship, and unfortunately, B'nai Israel has been and remains too little known. It was not included in Richard Meier's seminal 1963 Jewish Museum exhibition Recent American Synagogue Architecture, and thus lost the chance to be recognized by a wider audience in succeeding decades, and the catalogue of that exhibit subsequently became a primer and guide to significant modern synagogue design. I greatly regret that i perpetuated B'nai IsraeI's isolation by not including it in my 2003 Rizzoli book, American Synagogues: A Century of Architecture and Jewish Community (Beth El in Providence, Rhode Island's other great modern synagogue, did make it in). Woonsocket, Rhode Island. B'nai Israel Synagogue. Samuel Glaser, architect; Avigdor Arikha, stained glass design. Arikha's signature on the glass, 1962. Woonsocket, Rhode Island. B'nai Israel Synagogue. Samuel Glaser, architect; Avigdor Arikha, stained glass design, 1962. Photo: Louis Davidson. 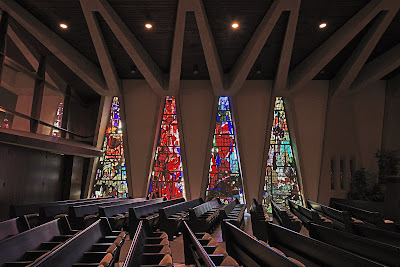 "... the sanctuary and auditorium's thirty stained-glass windows may be the finest ensemble in a modern American synagogue. Perhaps the architect thought about this medium in terms of his own name, although glass has meant something altogether different—and horrifying—to world Jewry since Kristallnacht in 1938." 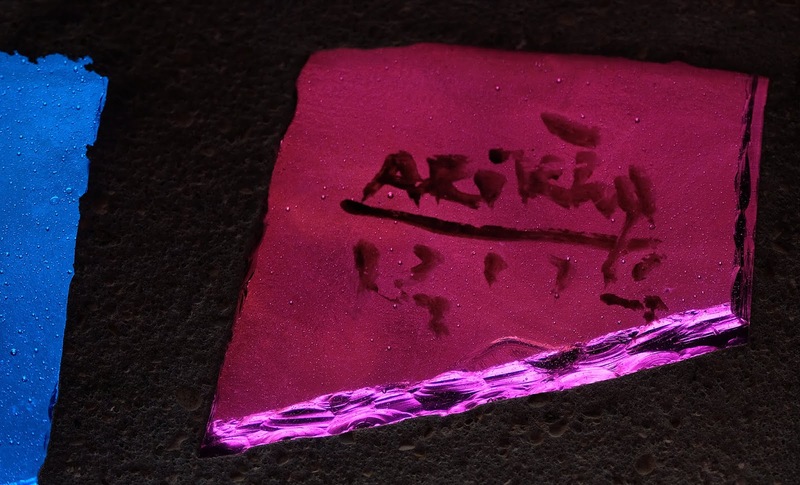 "I have written about Arikha in my book, Depiction and Interpretation: The Influence of the Holocaust on the Visual Arts and have always found him to be a fascinating and very important artist. 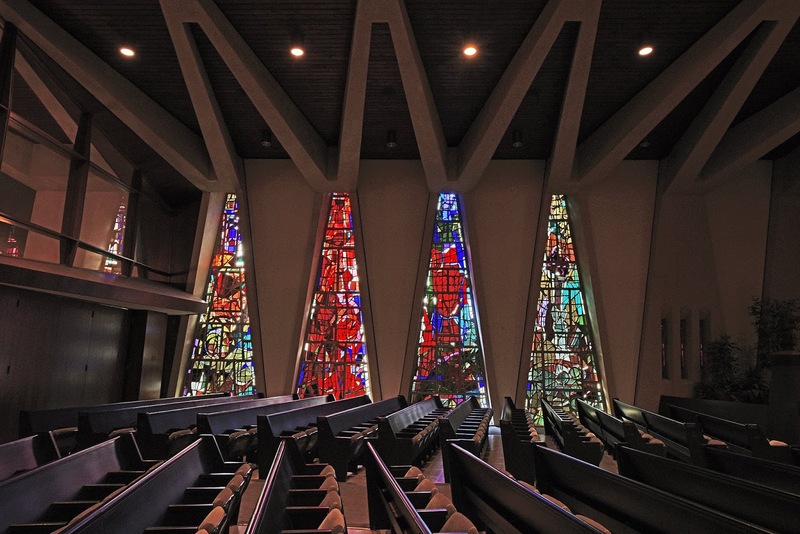 The windows are one of his last and most successful forays into abstract art and should be preserved at all costs, whether in a synagogue, museum or any public place available, not only for their historical importance but for their beauty. They are not only important in a Jewish or Israeli context, but internationally, as he was an internationally renowned artist, starting from his abstract stage." But it seems clear that that power of the windows is in large part because of their number and their setting within their architectural frame. These enormous windows are not easily moved - and if they would be it is not c;ear they would maintain their power. At next week;s meeting will explore as many options as we can imagine for the survival of the buildings and its windows. We hope that this discussion is not too late. Other important modern synagogues have been torn down and as I write this, I learn from Brad Kolodny that Temple Emanu-El in East Meadow, Long Island, built in 1957 and designed by Davis, Brody and Wisniewski is soon to be demolished. Temple Emanu-El, of which I will write more, was of the synagogues prominently featured in the 1963 Jewish Museum exhibit. May 6th, 2018 was a lively Sunday on New York's Lower East Side. The Greek-Jewish Festival was in full swing on Broome Street, filling the street for a block with music, food, and souvenirs in front of the historic Romaniote KKJ (Kehila Kedosha Janina) synagogue, while a few blocks down Eldridge Street the great Eldridge Street Synagogue - now the Museum at Eldridge Street - was open to visitors as part of the state-wide New York Landmarks Society organized Sacred Sites weekend. There were self-guided and docent-guided tours, all culminating in a lively concert in the sanctuary by the Eyal Vilner Big Band. These two poles of Eldridge Street, now embedded for many years in New York's expansive Chinatown, are the ying and yang (are those Yiddish terms?) 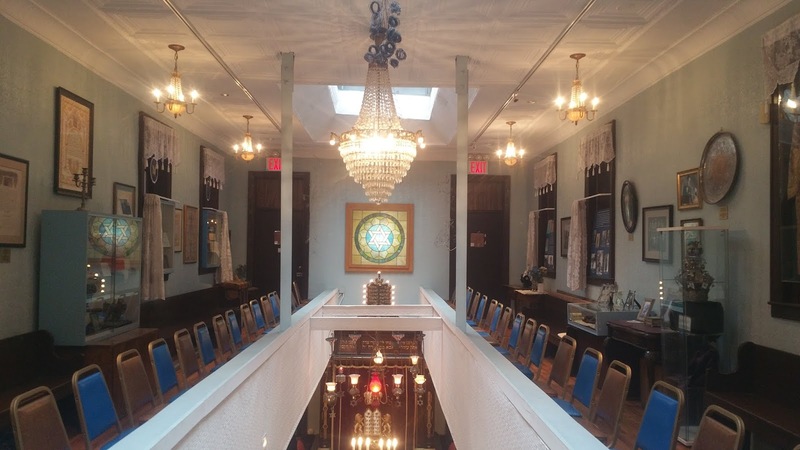 of the former Lower East Side religious and architectural experience. The Eldridge Street Synagogue, opened in 1887, was the worship palace, the grand Moorish-style response of the Yiddish-speaking Eastern European downtown Jews to the often ostentatious architectural displays of their Uptown, German-speaking but increasingly Americanized "cousins". Meanwhile, gathered around Eldridge (and also around the nearby and now demolished Beth Hamedrash Hagadol), were dozens of small synagogues, what we now call "tenement shuls," tucked into the dense residential fabric of the neighborhood dominated bu over-crowded tenement buildings. Most of these shuls belonged to Yiddish-speaking Eastern European Jewish congregations and societies, too, all except for KKJ. This tenement shul, opened in the 1920s, was the home of different Jewish immigrant group. KKJ's congregants came from Greece and mostly from the northern mainland city of Ioannina, for centuries the bastion of the Judeo-Greek language and culture and the ancient Romaniote liturgy - which predates the 15th- and 16th-century arrival and spread of Sepahrdi culture in the Ottoman empire, including modern Greece. A visit to KKJ allows one to experience the space and decor of a Lower East Side tenement Shul, but through the museum and the weekly services, to imbibe something of the Romaniote culture.The shul and museum are open the public every Sunday, and the congregation is always welcoming to participants for Shabbat morning and holiday services, but check the on-line schedule first (For a traditional Friday night or Saturday morning Ashkenazi service in another tenement shul, visit the Stanton Street Shul, located about a ten minute walk from KKJ). A 5-minute walk down Eldridge Street from KKJ on Broome Street takes one to the great Eldridge Street Synagogue, but along the way one passes the former Tifereth Jerushelaim Synagogue, which for years was the studio of modern abstract artist Milton Resnick (1917-2004). Resnick, who was born in Bratslav, Ukraine, came to America in 1922. Thee former synagogue will soon re-open to the public as the exhibition space of the Resnick/Passlof Foundation celebrating the life and work of Resnick and his wife, artist Pat Passlof (1928-2011), who had her own studio in another former synagogue on Forsyth Street, also on the Lower East Side synagogue. Read more about Resnick and Passlof here. Nothing significant of the synagogue interior survives, but it appears to have had a large upstairs 2-level sanctuary, presumably with a women's gallery. The building was mostly lit by the large windows on the facade. New York, NY. Former Tifereth Jerushelaim Synagogue in 2005 Photo: Samuel Gruber 2005. New York, NY. 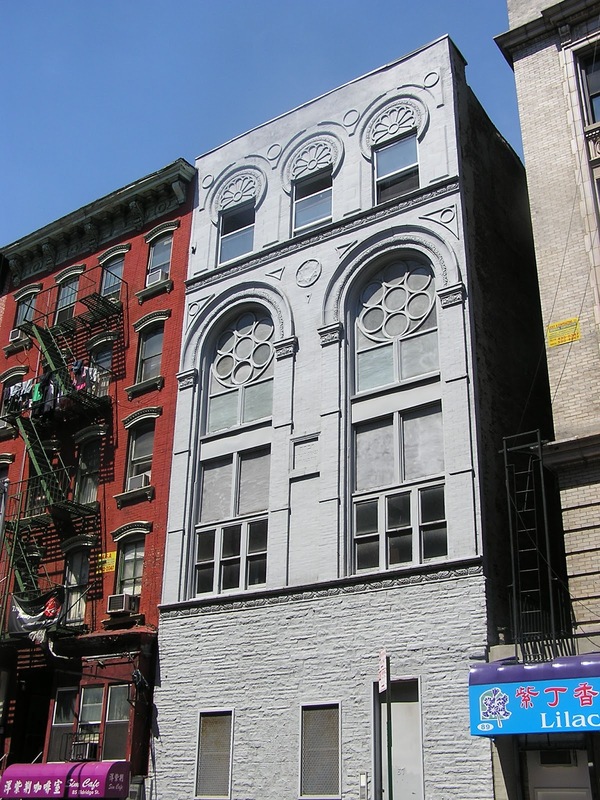 Former Tifereth Jerushelaim Synagogue, 87 Eldridge Street, now the Milton Resnick and Pat Passlof Foundation. Photo: Samuel Gruber 2018. According to the Foundation's website: "The Milton Resnick and Pat Passlof Foundation will be a largely traditional exhibition space upon its opening in February 2018. Housed in Milton Resnick’s former studio building on Eldridge Street, the Foundation will exhibit paintings on canvas and paper by Resnick, his wife Pat Passlof, and other mature painters working out of the Abstract Expressionist tradition, broadly defined. The emphasis will be placed squarely on the one-to-one confrontation with painting itself." Word from the Foundation is that the opening is now hoped for at the end of this month, but you can follow progress with the Foundation Newsletter free to subscribers here. The use of the synagogue as exhibition space adds another dimension to the Jewish history of the Lower East Side, recognizing the second lives of many synagogues in the area, and the prominent by mostly-undocumented role the American Jewish post World War Ii artists played in the continued Jewish history of the area. There is more than a century of Jewish secular and cultural life in between, and later actually within the walls, of synagogues and former synagogues. The highlight of any tour of Lower East Side synagogues is a visit to the Eldridge Street Synagogue. I never get tired of visiting. Each time I'm struck by the beauty of place and the lasting quality of the restoration. I've written and lectured about the Eldridge Street restoration many time in the past, and I'm sure i will again. One aspect of the restoration, however that may link this place with the Resnick/Passlof Foundation, is the large new rose window above the Ark - a window designed by contemporary artist Kiki Smith and a work that moves the 19th century Moorish-style synagogue, and the late 20th-century restoration into to the world of 21st century art. For me, the new window overpowers the decades of meticulous restoration work, but mine is a minority view. The new window is a very popular addition to the building that opens a new chapter in the building's life. New York, NY. Eldridge Street Synagogue. Photo: Samuel Gruber 2018. I always try to bring new visitors to Eldridge and I love seeing their expression as they first enter the sanctuary. If you have never been - be sure you take a Sunday walk on Eldridge Street your next time in the city. Walk form KKJ to Eldridge, or the other way around, and get of the Jewish religious and architectural diversity of a century ago. And for lunch - there are scores of Chinese restaurants in every direction.